Odell Beckham Jr. is listed as questionable but the New York Giants expect the All-Pro receiver to make his season debut on Monday NIght Football vs. the Detroit Lions. The New York Giants may have received some good news in anticipation of their Monday Night Football game against the Detroit Lions. 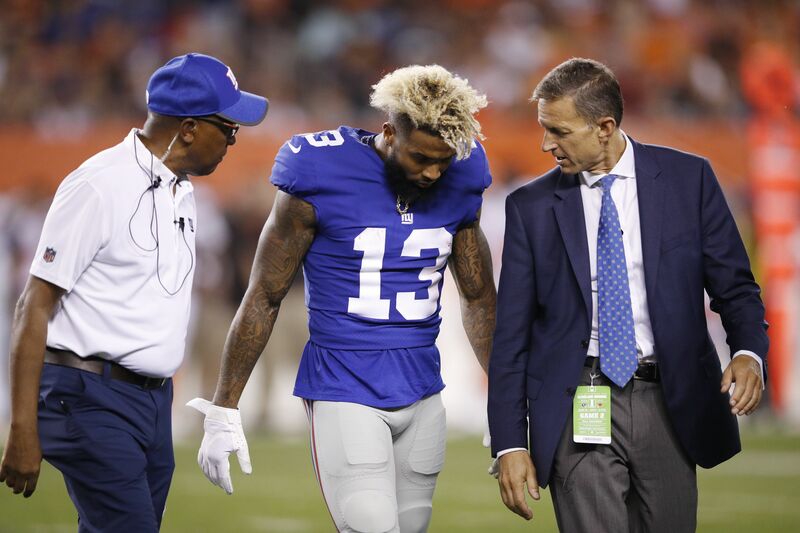 Odell Beckham Jr. is officially listed as questionable on the injury report, according to ESPN’s Adam Schefter. Beckham missed the team’s season opener against the Dallas Cowboys and Eli Manning really missed his top target. Manning was 29-0f-38 passing for 220 yards and an interception. Running back Shane Vereen led the team with nine receptions. Most importantly, without the down-field threat that Beckham provides, the Cowboys were able to load the line of scrimmage and take away the Giants run game. For the game, the Giants were limited to only 35 yards on 12 carries for a paltry 2.9 yards per carry average. Beckham returned to practice in a limited fashion this week, but early indications seemed to suggest he was a few weeks away from returning to game action. Perhaps it was the 10 hours worth of treatment he was receiving on his injured ankle because NFL Media’s Ian Rapoport reports Beckham is expected to play despite the questionable designation. #Giants list WR Odell Beckham Jr (ankle) as questionable for the MNF game vs the #Lions. The expectation is that he makes his season debut. This is a quick recovery for Beckham and the Giants certainly will need him against the 1-0 Lions who beat the Arizona Cardinals behind another fourth-quarter comeback led by Matthew Stafford. However, there should be hesitation about if the Giants will be getting the explosive playmaker that has put up incredible numbers since he made his NFL debut three years ago. If Beckham isn’t fully healed, he may not have the top-end explosiveness and the ability to get in and out of his breaks. If he’s a step slow, it stands to wonder if his effectiveness will be limited or if he should have been sidelined at least one more week for the ankle to heal. If you have Beckham on your fantasy team, be sure to monitor the injury reports leading up to the game to make sure he’s safe to put in your lineup. But if he does play, you may want to lower your expectations in his first game back from the injury.